Denis is pictured here with 4 year old filly "Don't Tell Me No", winner of 4 races over 4 months, winter 2015, at 3 different tracks - Churchill Downs in Louisville, Hawthorne Racecourse in suburban Chicago and Turfway Park in northern Kentucky! Denis is active in the local community, supporting organizations like Second Stride non profit organization for retired thoroughbreds. 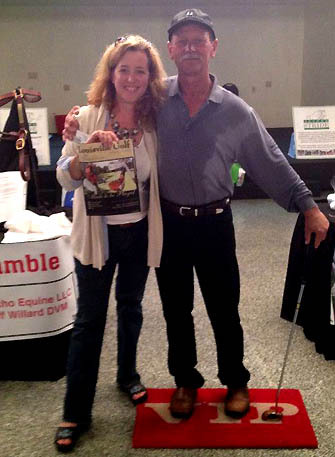 Denis is pictured here receiving an award at the Second Stride 2nd annual CHARITY GOLF SCRAMBLE in Louisville, Kentucky. Denis has a lifetime of experience preparing two year olds for their first race. His tactful skill with young horses keeps them sound and quiet so they have the best possible start for a long racing career, and a good foundation for a second career after their racing days are over. 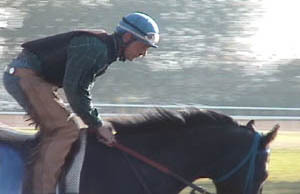 Denis Roberson trains at Churchill Downs' Trackside Training Center in Louisville, Kentucky. He also keeps some horses at Glenwood Training Center in Southern Indiana, an excellent facility for starting young horses or giving older horses a break in a quiet environment that is conveniently located near the region's racetracks. 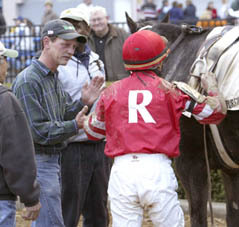 Denis races in Kentucky year round at Churchill Downs, Keeneland, Ellis Park, Turfway Park, and Kentucky Downs. He also ships to surrounding states for the best racing opportunities in Indiana, Illinois, Arkansas and West Virginia. Denis is a hands on trainer - he gallops and breezes his horses, he does all their gate schooling, leg work, and most other day to day care. This intimate knowledge of the horses allows him to prepare horses for racing in the most thorough way possible. 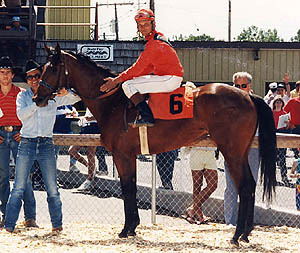 Denis Roberson started his career in racing as a hugely successful rider on the Midwest Fair circuit. Denis once rode 5 WINNERS FROM 7 MOUNTS IN ONE DAY! 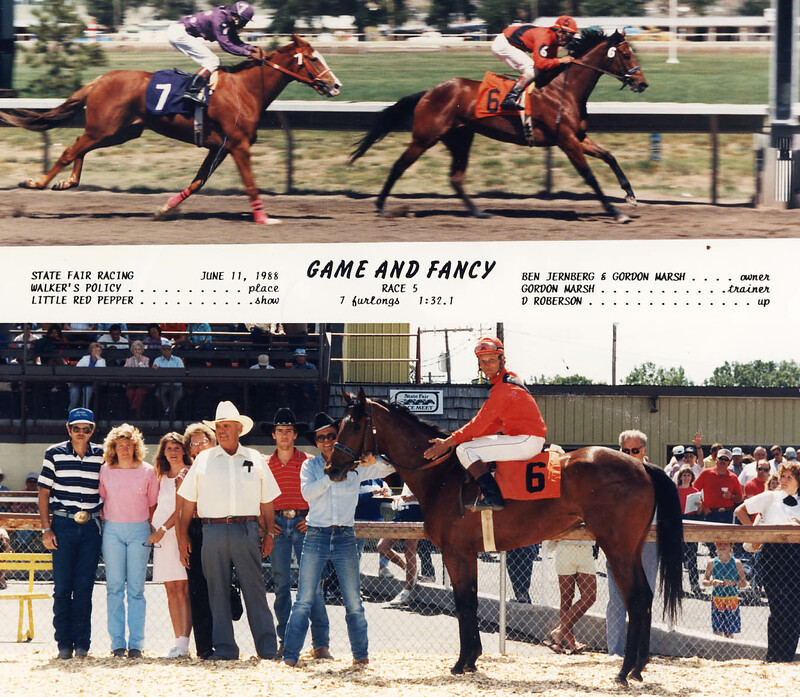 Denis is pictured at right aboard winner "Game and Fancy". Denis started his training career in the late 1980's. Owners Clarence Smith and Robert Roberts of Illinois hired Denis to train for them shortly thereafter. 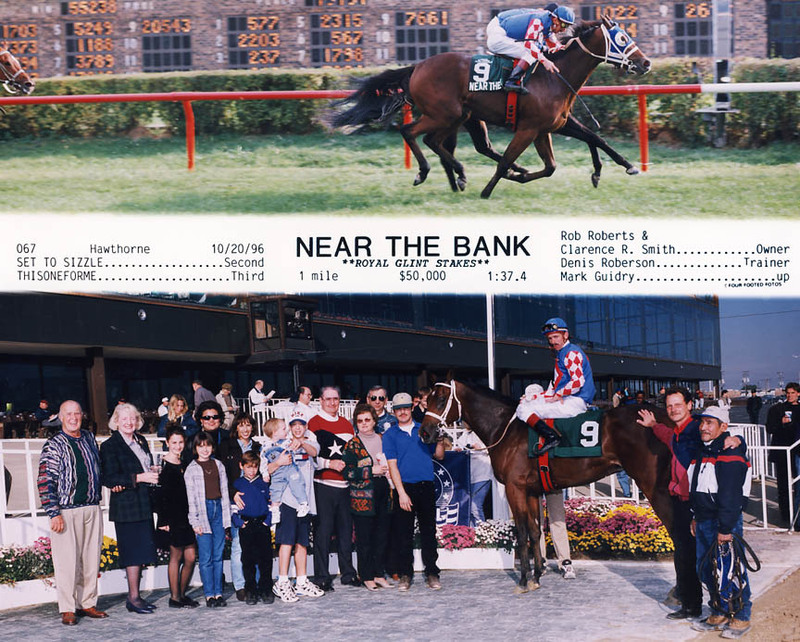 That relationship resulted in many winners including multiple Stakes Winner "NEAR THE BANK". 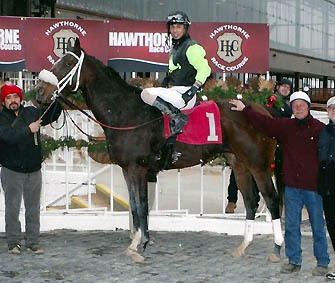 NEAR THE BANK was purchased for only $3500, started under saddle at the owners' small farm in Illinois, and prepped at Fairmount Park in St. Louis, before breaking his maiden in his first start at Ellis Park. 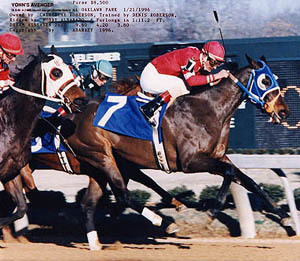 NEAR THE BANK then finished 2nd to Boston Harbor in the Ellis Park Juvenile. 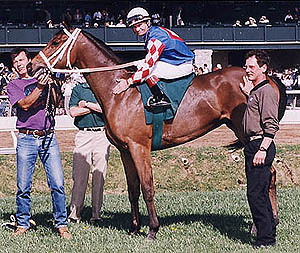 He won the Royal Glint Stakes at Hawthorne and the T.V. 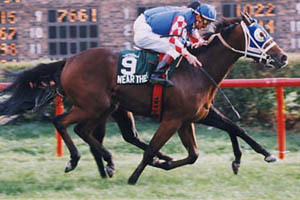 Lark at Arlington, both on turf. 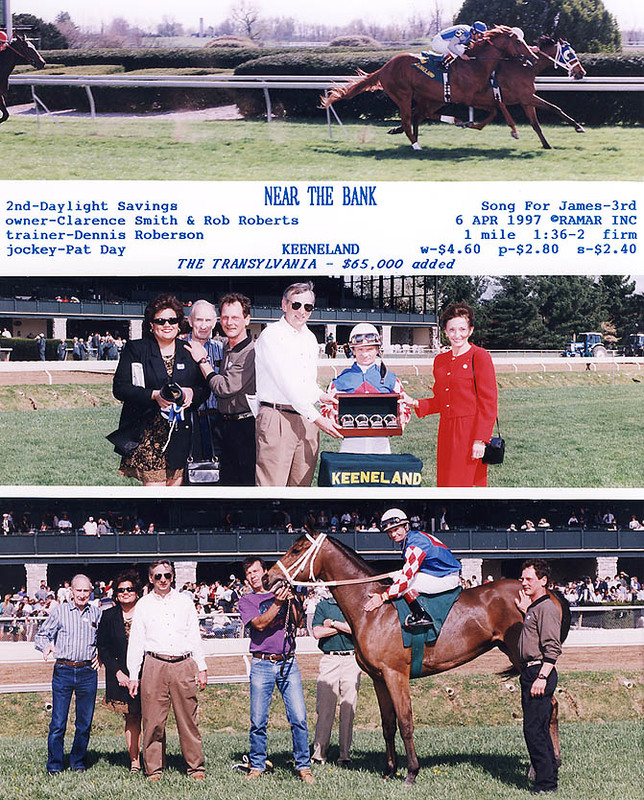 NEAR THE BANK's efforts prompted Denis to enter him in THE TRANSYLVANIA STAKES AT KEENELAND where he won gamely carrying high weight with Jockey Pat Day. Click the photo at right for the full win picture from the Transylvania Stakes. 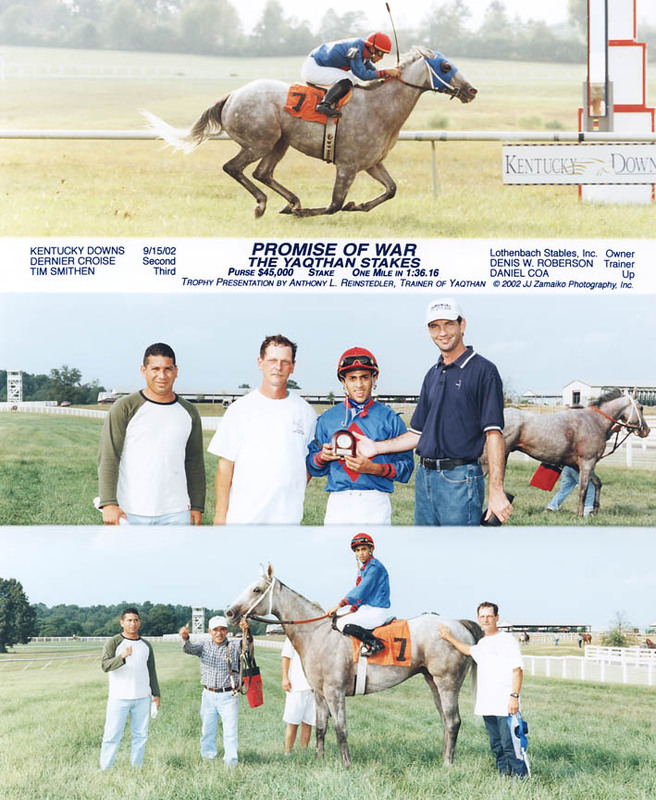 Lothenbach Stable's PROMISE OF WAR, trained by Denis Roberson, won the Yaqthan Stakes at Kentucky Downs in 2002. 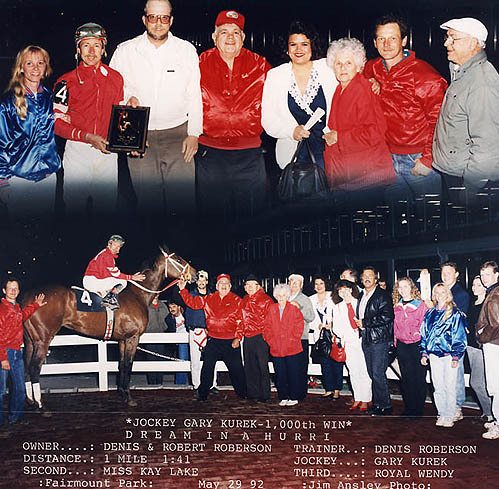 Denis and Catherine Roberson have had great success for many years running their own horses, including hard knocking claimer Vonn's Avenger, who won 8 races for the Robersons at Fairmount and Oaklawn. 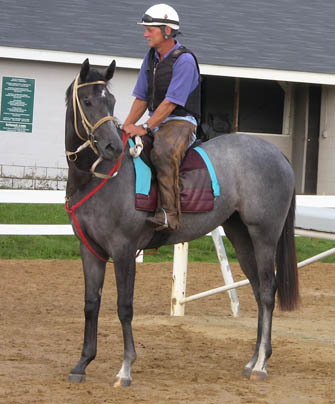 If you are interested in claiming a horse to race on the Kentucky circuit, Denis is one of the best in the business at identifying value in a claiming race. Contact Denis at 502-608-8320 to find out how you can claim a horse to race now.